He’s had a good run this year. Stan first made the top 10 in 2008 after making his first Masters 1000 Final in Rome, but he finished that year ranked number 13, so he missed out on the end of year tournament, then called the Year End Championships, held in Shanghai. We did it! I see you London! I just want to thank the USTA for all their support. Could not have done it without them. What links Wawrinka, Tipsarevic, and Fish is that each was a veteran enjoying a career season. Wawrinka is 28, as was Tipsarevic when he qualified last year. Fish was a month shy of his 30th birthday. Juan Martin Del Potro will be in London this year as well, sadly without a few personal items lifted from him in a Paris train station on Saturday. Del Potro has qualified for his fourth World Tour Finals, so he’s an experienced campaigner at this level – and you can easily make the case he’d have been there in 2010 and 2011 but for injury. With four finals under his belt, Del Potro is by no means the most seasoned campaigner to make his way to London. Roger Federer is making his 12th straight trip, Novak Djokovic his seventh. Rafael Nadal will be at his sixth year end championship, having withdrawn from the 2005, 2008, and 2012 events because of injury. David Ferrer has attended five times, Tomas Berdych four; Richard Gasquet rounds out the lineup, having competed once before as a 21-year-old at Shanghai in 2007. Gasquet wasn’t the youngest player in Shanghai that year – Novak Djokovic was. Djokovic passed that baton next year on to Del Potro. Born in September 1988, the 2009 US Open champion became the player with the latest birth date to reach the final stage of the ATP tour. Five years later, Del Potro still holds that distinction. For casual tennis fans, and for tennis commentators and journalists reaching for conventional wisdom, the ATP can be summed up in two clichés: this is the era of the Big Four, and 30 is the new 20. Both of these clichés are grounded in fact, but both miss something vital – something hiding in plain sight. The ATP has stopped making good young tennis players. One place you can see this is in the World Tour Finals entry field. I went back to 1986, which is when the current format kicked in – eight players, round robin followed by semifinals and final. I looked at the ages of the eight players who began the tournament: as with Nadal, players who qualify sometimes withdraw, while players also retire from the tournament or compete as alternates. The chart above shows, as red squares, the ages of the eight players who began each tournament, together with a black line showing the average age of the competitors. 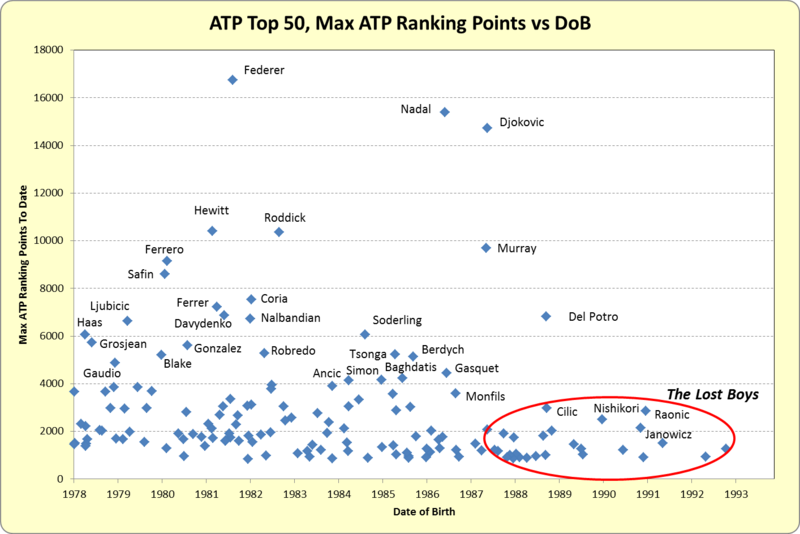 Between 1986 and 2008, the year Del Potro first competed, the average age fluctuated for the most part between 24 and 26. Not many players have made it to the last eight as teenagers. In the last 20 years, only Andrei Medvedev (in 1993) and Lleyton Hewitt (in 2000) made the trip. The 19-year-old Nadal was ranked No. 2 in the world in 2005, but missed the Shanghai tournament (and the 2006 Australian Open) with a career-threatening foot injury. However, you can see from the chart that it’s been pretty rare for the youngest player in the tournament to be above the age of 22. Between 1986 and 2008, the age of the youngest competitor averages at 20.64 years. And between 1986 and 2008, the average age of all players was four years older – 24.65. This makes Juan Martin del Potro, the youngest player in London next week, half a year older than the long term average. By qualifying this year, Stan Wawrinka actually raised the average age of the eight players. As did Tipsarevic the year before, and Mardy Fish the year before that. Still, focusing on the top 8 players in the ATP doesn’t tell the whole story, surely? If there are a lot of talented young players knocking at the door, things should turn around quickly, right? That’s the problem. There aren’t any talented young players knocking on the door. The highest ranked teenager in the ATP is Australian Nick Kyrgios. Kyrgios is currently ranked 180: his career high is 177. Kyrgios has a 2-2 record in 2013 at ATP Tour level. What about the 20 year olds? Only one player under the age of 21 is ranked in the ATP top 100. Step forward, Jiri Vesely, of the Czech Republic. Ranked 87 in the world, Vesely is 0-7 in ATP Tour matches in 2013. As you can see, with the exception of Del Potro, no ATP player born after Andy Murray has a career high over 3000 points. Good to great young players used to come along regularly, but for some reason they’ve stopped coming. A whole generation of players – who I call The Lost Boys – has failed to make any significant impression on the big titles. Enjoy the World Tour Finals, and the continued excellence of the Big Four while you still have them. But know this – the #ATPDarkAge is coming. Andrew Burton has written for tennis.com, and has covered the Indian Wells Masters 1000 on occasion. He likes to give short answers to your questions on Twitter. Really enjoyed this. Lots of useful data and information, plus a hunky Tipsarevic. Hopefully Wawrinka’s debut in London will not portend a slip in the rankings, as has been the path for Tipsarevic. I’m looking forward to watching a great week of matches. How could they not be? Thanks, Andrew. I don’t mean this as a challenge, but I’d be curious to know the particulars of, “Good to great young players used to come along regularly”. Was it really that frequent, or do we just remember it that way because a few supernovas remain sharpest in our memories? 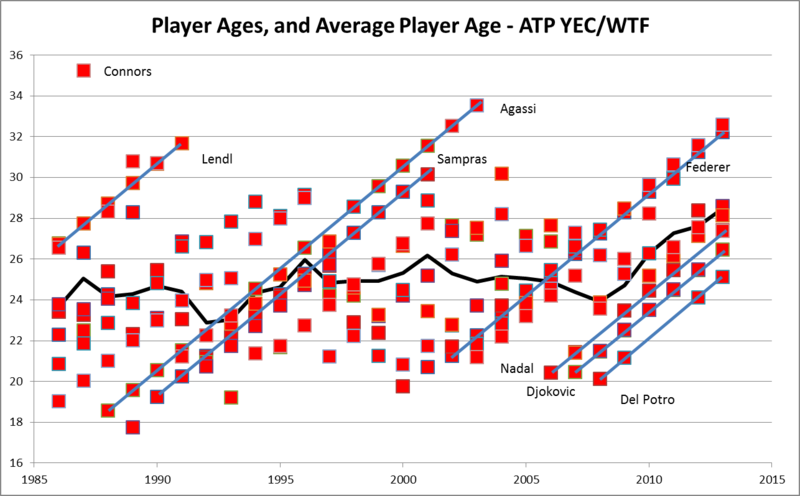 To proceed with the thought that younger players aren’t rising to the top like they used to: Is it because more well-rounded games have supplanted the short point play of the earliest years of modern racquets and string technology? I’d say Yes. No one can get to the top anymore with a game based on an average of (at most) 3 or 4 shots per point. As a consequence, the physical and competitive emotional maturity of slightly older players gains in value, and we see older players holding more places in the upper ranking regions. I also think history’s shown that many top flight players, if not #1, come upon us as something of a surprise. Then again, we are often fooled: Janowicz certainly looks to be the real deal, as does Pospisil, Rosol not really. It wasn’t long ago, in cosmological terms, that a player’s mid to late twenties were considered his prime years. Perhaps the contributing factors have shifted once again, and we’ve just returned to an older paradigm. Really interesting and fun text. Seems like we should indeed prep for the Dark Ages and enjoy this dominance of the Top 3 (or 4) while we can! Interesting stats. And if Tommy Haas had made the year-end finals (he was a longshot and will finish the year at #12, I think), he’d have brought the average age up even higher. For someone who’s been watching the junior slam events lately looking for some semblance of light at the end of tunnel, I’m sorry to report that none exists. Not that I see. Not yet anyway. I’d love a similar WTA analysis Andrew. I know, not your cup of tea, but perhaps another Changeover contributor can take over the torch? Epic! Andrew : wonderful analysis! that would be a disaster really… how can you promote new figures if they win nothing significant ? Darren Cahill talked about tennis “becoming an older generation sport” in an interview last summer. He said that players aren’t really breaking through until they’re 24-26 and not playing their best tennis until 28-30. The only explanation he gave for this was the sport’s physicality, although presumably there are several reasons. The author of this article has pointed out that there are no ATP players currently under the age of 25 making a Slam final. Also, I believe there are no players currently under 25 who has won a Masters title. Using that chart, I presume that means Novak Djokovic is the latest-born to win a Masters title. That might be the most frightening statistic of all! Interesting analysis. Wonder if the steadiness of the older players is also preventing the next generation from breaking through? Today’s guys seem to be peaking in their late 20s preventing the young up and comers from having breakthroughs. Indeed, we may be heading for a dark age on the men’s side. Women also seemingly have the same problem. WTA Championships was a battle of two women in their 30s. Am I the only one excited for the coming ‘dark time’? Lots of head-cases and big personality players. Hope they don’t get mellow by their media persons by the time they make it to the big stages.